public RTD organisations, SMEs, companies and other institutions of a scientific/technological nature. It has a staff of more than 13,500 employees, among these about 3,500 are permanent researchers and more than 4,000 are preand post-doctoral researchers. The CSIC has 126 institutes or centres distributed throughout Spain, including 50 Joint Research Units with universities or other research institutions. There is also a delegation in Brussels. It has considerable experience in both participating and managing RTD projects and training of research personnel. Under the 7th Framework Programme CSIC has signed as of today more than 580 projects (including 38 coordinated by CSIC as well as 32ERC). In this proposal CSIC participation is implemented via the Instituto de Fisica de Cantabria, IFCA5 . The centre develops research lines in, Advanced Computing, High Energy Physics, Environmental Sciences, Astrophysics, Statistical Physics and Meteorology, and participates in large international consortia like CMS\@LHC, PLANCK (ESA), XMM (ESA) and the ESFRI LIFEWATCH, where it coordinates the deployment of the ICT-CORE services to deploy biodiversity services across Europe. CSIC is the leader of the National Grid Initiative in Spain, and as such IBERGRID coordinator together with the coordinator in Portugal, LIP, also a member of this consortium. IBERGRID is the single point of contact at national level, and has the mandate to represent the national e-infrastructure activity in Spain and Portugal, in what regards EGI in EC e-infrastructure projects of the Horizon 2020 framework (see LoS attached). CSIC is responsible for the operation and coordination of the national distributed computing infrastructure that joins computing resources from universities and research centres. In view of the multidisciplinary nature of the IBERGRID constituency we foresee two areas for exploitation. One is on the supply side as a provider of IaaS. CSIC needs to investigate the provision of computing resources alone, or in cooperation with other providers in an elastic way needs to be exploited in the upcoming years. The other exploitation area is on the deployment of advanced services on top of our data facilities for scientific and technical users. Recently we have started to offer resources based on a cloud service model within the EGI coordination (Federated Cloud of EGI). The center is also hosting a number of databases in different fields like CSIC Digital Library contents, and environmental data related to observations of water quality. LIP is the coordinator of the Portuguese National Grid Initiative (NGI) infrastructure. In 2014, the NGI evolved into a National Distributed Computing Infrastructure (INCD) reflecting a larger scope of technical activities and competences. INCD has been recently approved for the Portuguese Science Foundation (FCT) infrastructures roadmap. In the INCD context, LIP is responsible for the operation and coordination of the national distributed computing infrastructure that joins computing resources from universities and research centres. INCD is the Portuguese side of the IBERGRID initiative. IBERGRID unifies the Portuguese and Spanish distributed computing infrastructures and enables a joint Iberian participation in EGI. In the INCD and IBERGRID contexts, LIP needs to provide scientific computing services to the research community encompassing grid, HPC and cloud resources. Therefore the enhancement and combined use of these resources through a PaaS solution and easy to use portals are of great interest. The Italian National Institute of Nuclear and Particle Physics (INFN) was founded in 1951 and is a governmental research organization with 20 divisions, 4 national laboratories and three national centers spread throughout Italy. Its mission is to promote, coordinate and fund nuclear, particle and high-energy physics research in Italy. Since its inception, INFN has been developing open ICT innovative solutions for its own advanced needs of distributed computing and software applications. It has a remarkable excellence expertise on Grid and Cloud technologies, having fostered and participated, with leadership roles, to many of the large Projects financed by the EC that eventually led to the realization of the European Grid Infrastructure (EGI). The Grid middleware, based on open standards and protocols and on high-level security technologies, provides researchers with an integrated access to computing and storage systems, heterogeneous and owned by various institutions, establishing a new scalable paradigm, replicable in other sectors of the society (e.g. eGovernment). The middleware used in almost all the 350 EGI Data Centres was designed, developed and released by the European Project EMI (European Middleware Initiative), where INFN was one of the main partners. INFN itself develops and provides many of the key components for the EGI operations, including the general interface to computing resources (CREAM), the interface (based on the OGF standard called SRM) to access distributed storage (StoRM), used by the main INFN Data Centre (CNAF‐Bologna) and by other European centres, the Virtual Organizations Membership Service (VOMS), the resources access policies service (ARGUS), the accounting service (DGAS), the Workload Management System (WMS) and an access service to the computing infrastructure based on federated authentication and authorization systems. Furthermore INFN has been developing an open Cloud IaaS solution, integrated in Grid (WNoDeS), that was one of the solutions of the EGI Cloud Task Force, and the Catania Science Gateway Framework that is one of the frameworks fostered by EGI. INFN, as coordinator of the Italian Grid Infrastructure (IGI) is leading the development of distributed computing also at the national level, having established one of the largest European Grid infrastructures, including more than 56 national Data Centres. INFN has well established collaborations with the main international Research Centres involved in the development of ICT solutions for the scientific world and is a primary partner of many projects funded by the EC through the FP7 program. INFN has recently started a challenging participation to two national projects (PRISMA and Open City Platform), funded by the Italian Ministry of Education and Research and belonging to the Smart Cities and Communities framework, to develop open source cloud solutions capable of federating different cloud services provided by both public institutions and private companies. This open source and standard‐based federated cloud aims at allowing different actors (private companies, academic and research institutions, public sector institutions) to provide efficient, cheap and standard-based services to the various Italian public administrations. Some pilot public administrations are involved in these projects with the role of validators of the federated cloud solution by means of application/services/procedures (implemented as SaaS or PaaS) of their interest. INFN has matured extensive experience with agile software development processes through several previous European projects, such as EMI, WeNMR and the EGEE series. Poznań Supercomputing and Networking Center (PSNC) is affiliated to the Institute of Bioorganic Chemistry of the Polish Academy of Sciences. PSNC employs about 250+ people divided into four departments. It is an HPC Center, Systems and Network Security Center as well as R&D Center of Future Internet, e-Infrastructure, Digital Content, Portals and Mobile Applications. PSNC is also the operator of Polish National Research and Education Network PIONIER, which is connected to the GEANT2 network, Operator of Poznań Metropolitan Area Network POZMAN. PSNC is a leading HPC center in Poland with its 300+ Tflops of computing power, storage and data management infrastructure, providing direct support for the scientific communities in Poland as well as in Europe (e.g. Nuclear Fusion, Astrophysics, Bioinformatics, Chemistry). It has been coordinating 6 international EU projects (e.g. 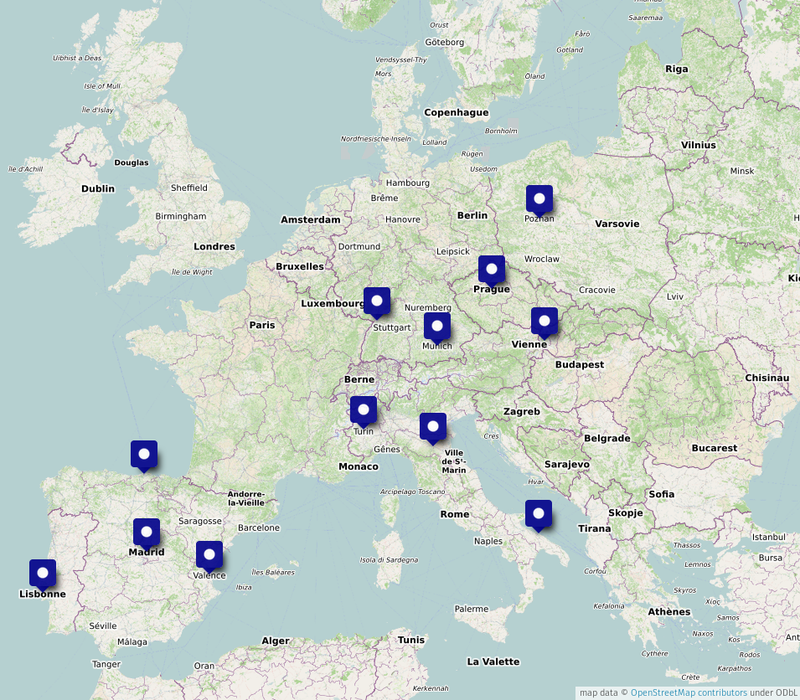 DORII, RINGRID, GRIDLAB, Phosphorus, Porta Optica, CoolAmAll) and participated (or participating) in 80+ European and national projects (PRACE, EUDAT, IGE, NEXPRES, EGI_INSPIRE, EUFORIA, EUROFusion etc.). PSNC is the Microsoft Innovation Center and one of the founding members of PRACE AISBL, and a partner of Polish NGI. PSNC takes an active part in many international conferences and forums, including the Open Grid Forum, e-IRG. PSNC has long record of expertise in developing, deploying and supporting scientific workflows frameworks (e.g. VLAB, KIWI, Kepler). It is official contributor and part of the leadership (as European representative) of the Kepler scientific workflow system and community. PSNC has expertise in developing native mobile apps (e.g. Conference4me, SmartZoo, ePodreczniki) for different platforms(iOS, WindowsPhone, Android). PSNC has expertise in developing cloud related tools to support PaaS approach like plugins from private cloud to public clouds, services to be offered for SMEs in clouds. PSNC will lead WP6, and contribute to the User Interface/Toolkits in particular mobile apps, having large expertise in developing mobile apps. (apps: Conference4me, smartzoo, ePodreczniki) PSNC will contribute to tasks relate with scientific workflows having long record of expertise in scientific workflows orchestration area (tools: Kepler, VLAB, KIWI, projects: EUFORIA, EFDA ITM-TF, EGI_Inspire, PLGridPlus, NEXPRES). PSNC will contribute its experience (see below) related to design, deployment, scalability and performance analysis and optimisation of distributed, HPC and cloud data storage, access and management systems. PSNC development team is competent in the area of system programming, storage interfaces design and development, distributed data management software development etc. Particular topics that can be dealt by PSNC include: data access, pseudo-local transparent data caching, stage-in/stage-out mechanisms, POSIX-drives/virtual filesystems (Linux, Windows, Mac) for transparent data access, storage protocols translation and adaptors for undelying IaaS and external storage systems. PSNC have a background and participates in EUDAT in PRACE and can develop interfaces: to EUDAT (HTTP/CDMI, iRODS, EUDAT storage federations) and PRACE (GridFTP, SFTP). Karlsruhe Institute of Technology (KIT) is the combination of a science and research institution with a University in Germany. Funded by the Federal Republic of Germany and the state of Baden-Württemberg KIT is leading in innovation, research and teaching with a staff of 10000 employees and 25000 students. KIT is a member of the Helmholtz Association of German Research Centres. Steinbuch Centre for Computing (SCC) operates the central computing centre of KIT to support the IT-demands of the various research Programmes within KIT and within the Helmholtz-Association of German research centres. It has solid experience in both, distributed computing infrastructures (DCIs) as well as identity management and security in DCIs. SCC developed and runs the largest German university cloud storage for sync-and-share, providing access to more than 350,000 students and 100,000 researchers. SCC provides 22 PB disk (+22 PB tape) storage to a diverse range of scientific experiments hosted at more than 130 institutes on site. SCC successfully participated in several European projects such as CrossGrid, Int.EU.grid, EUFORIA, EGEE-1, EGEE-2 and EGEE-3, EGI-Inspire and is currently contributing to EUDAT. SCC has coordinated the G-Eclipse project and currently coordinates MMM@HPC. Furthermore, SCC is founding member of the OpenCirrus Cloud Initiative. The Grid and High Performance Computing Group (GRyCAP) from the UPV, has a very strong background in Distributed, Cloud Computing and Data Management, especially in the area of Biomedicine. GRyCAP has shared and extended its expertise through active participation in over 30 national and European R&D projects on HPC, Grid and Cloud technologies. These projects include HPCN-TTN Network, EUTIST-M and TT@MED – technology dissemination; EGEE-I, II, III, EGI- InSPIRE and VENUS-C – e-infrastructures. It is one of the founders of the Institute for Instrumentation for Molecular Imaging (I3M); took part in the International HealthGrid Association; has developed a roadmap on the use of grids in health (SHARE), and boasts a solid research line in the distributed storage of medical imaging data through the TRENCADIS platform (CVIMO project). Relevant GRyCAP expertise includes: the coordination of the cloud end-user community (27 applications, 20 coming from an Open Call) in the VENUS-C project, one of the first cloud projects to feature in the DAE, the development of distributed and GridComputing platforms with Latin American countries: CyTED-GRiD, EELA and EELA-2, the EU-BrazilOpenBio Project and the EUBrazil Cloud Connect project (the UPV is the coordinator), and development of high-level middleware components for cloud infrastructures in the Spanish Codecloud project (and the recently approved CLUVIEM project) and coordination of the Spanish Network for e-Science to implement the Spanish National Grid Initiative (NGI). The UPV has a close collaboration with the bioinformatics institute of the Research centre Prince Phillipe (CIPF) and the Center for Public Health Research (CSISP). The participation of the UPV will be two-fold. First, the UPV will provide the link to medical imaging databank communities active in EUroBioImaging and BBMRI ESFRIS. In this sense, UPV will gather requirements from participating communities and implement the pilot use case. Second, the UPV will participate in Cloud Computing Virtualization and in High-level geographical scheduling (APIs), leveraging consolidated experience in national and international initiatives in automatic configuration and elastic management of infrastructures. The UPV will also actively participate in the dissemination of the project results. CESNET, Association of Legal Entities, is a public non-profit organization established in 1996 by all the public universities and the Academy of Science of the Czech Republic to do research, development and deployment of advanced network technologies and applications. Serving as a recognized Czech NREN and NGI, CESNET’s funding is guaranteed by a combination of membership fees, payment for services by non-members, and a governmental contribution. CESNET is a member of several international organizations, including DANTE, TERENA, CEENet (Central and Eastern European Networking Association), GLIF (Global Lambda Integrated Facility), and EGI.eu (European Grid Infrastructure). CESNET is also involved in many national and international projects, including GEANT and EGEE series of projects, Phosphorus, Lobster, EUAsiaGrid. CESNET was a coordinator of the EGI Design Study project and is currently involved in EGI InSPIRE, EMI and CHAIN projects. In its role as a National Grid Initiative, CESNET not only contributes grid and cloud resources to the European Grid Infrastructure, but also operates a separate Czech national grid and cloud environment. Among other areas, CESNET experts have been focusing on Authentication, Authorization and Identity management in distributed infrastructures, and on cloud interoperability and standardization. They are involved in the work of the OCCI Working Group at the Open Grid Forum, and contribute to various open source cloud products, including OpenNebula.